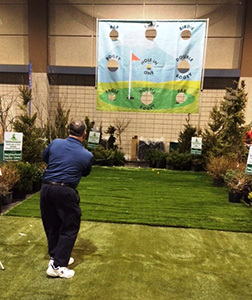 Unseasonably warm weather outside didn’t keep thousands of golfers from heading indoors over the weekend of February 6, 7, and 8 for the annual Kansas City Golf Show at the Overland Park Convention Center. Golf enthusiasts formed long lines to get into the show each day, with early birds getting a free sleeve of golf balls and free rounds of golf at Hillcrest Golf & Country Club and Prairie Highlands Golf Course before they even got into the show itself. The show featured several high-tech hitting nets where golfers could test shot accuracy and driving for prizes. Bob LaPorte took a stab at chipping a ball through one of several holes in a net to win a prize. “I just missed an eagle,” said LaPorte, who plays Deer Creek among other area golf courses. Nearby, Chris Fuller pounded a drive into a golf screen. The tee shot would have gone an estimated 323 yards, according to the measurement device. Fuller’s drive on Saturday was the second the longest of the morning at that point, with the leader at 341 yards. “They probably give you an extra 20 or 30 yards,’ Fuller said. Indeed, the simulated hole was slightly downhill, said Kim Robertson, owner of IndoorGolfKC.com, which provided the TruGolf simulator that can be rented or bought. “We try not to make it too hard on people,” Robertson said. In addition to pitching and driving competitions, a putting turf was also set up for golfers to test their skills for prizes on flat and undulating surfaces. 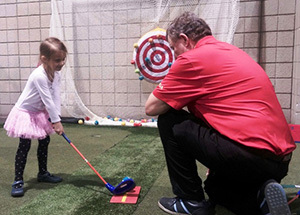 The little tykes could use over-sized plastic putters and clubs in their own hitting areas. Many people at the show headed right to a huge area of used clubs, apparel, and golf supplies that took up a large chunk of the floor space. Customers found discounts on a vast range of iron sets, drivers, wedges and putters – some nearly new. On the other side of the show floor, however, plenty of people were trying out new clubs from several manufacturers. 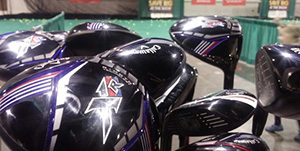 They were being fitted on the spot with adjustable driver heads and irons. Every serious golfer should be fitted for the right clubs, Srixon sales representative John Mason of Overland Park said as he adjusted clubs at the show. Mason said the loft of individual irons remains the same across brands but the bottom edge of the club can be adjusted to account for the angle impact in the player’s swing. That angle, plus the club speed, is evaluated in the fitting process, he said. Instruction was also a big at the golf show, with teaching professionals taking the stage every two hours to provide game-improvement tips. Kids could get in on the action too, with special instruction and equipment just for them. Some area golf courses had booths at the show, including Hillcrest and Prairie Highlands, which are under the same ownership. People who get a membership at Prairie Highlands get the first month free. Among promotions at Hillcrest is an executive membership for people under 40 at $150 per month, said course general manager Shawn McGuire. Courses from the Ozarks and states such as Alabama, Texas, Virginia, Minnesota, Oklahoma and Nevada had booths at the show. The show offered pizza, sandwiches and other food as well as an elevated bar where customers could pull up a stool and survey the golf show scene. Strong interest in the show indicated that golf remains popular. 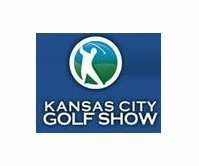 The year 2014 saw good play, despite the growing competition for the sports and entertainment dollar of consumers, said Jacque Madison, who tended a booth at the show for the Kansas City Golf Association.